In a beauty competition with a difference, the Italian public has chosen a marble rendition of Napoleon Bonaparte’s sister as their ideal depiction of female beauty. And in coming top in the poll of over 1,000 Italians, Canova’s early 19th-century sculpture, Paolina Borghese, beat celebrated female figures painted by Botticelli, Titian and Hayez – and left Leonardo’s Mona Lisa for dead. 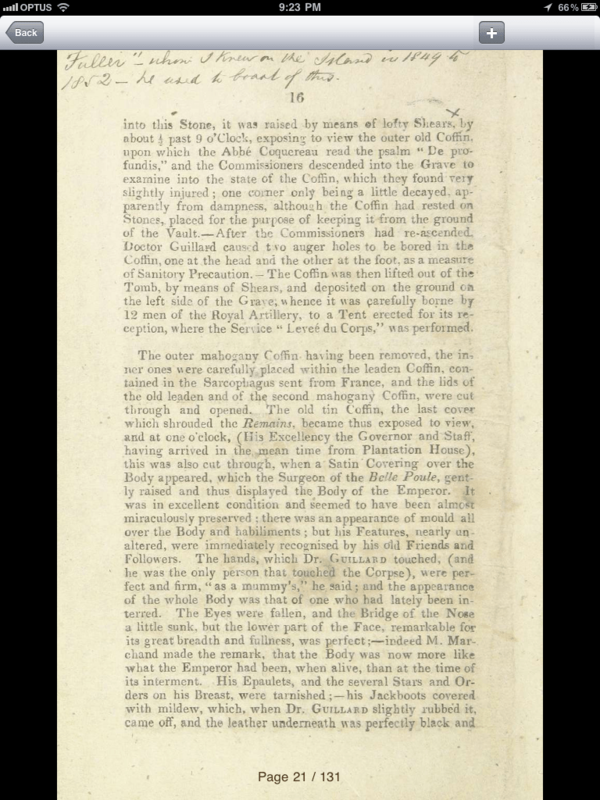 This is an excerpt from “The Exhumation Of The Remains Of Napoleon Bonaparte” by M. Janisch, late Secretary to Sir Hudson Lowe at St. Helena, which I downloaded from the British Library Historical Collection iPad app. I was fascinated by this first-hand account. The report of his body, buried for 25 years, looking like it was still fresh, is apparently used as evidence for arsenic poisoning. New Orleans-based antique, fine art and jewellery dealer Rau Antiques are offering a custom made sculpture of Napoleon Bonaparte with a price tag of $198,000. Created by the famous French artist Jean- Léon Gérôme in 1897, the neoclassical sculpture depicts the legendary French military leader on a horse during his attempt to gain control of Egypt in 1798. Created using “chryselephantine”, an ancient style of creating statues, the art workpiece has a wooden inner core and is overlaid with gold and ivory. The latter material was used for Napolean’s face in order to create a more realistic textured look. Measuring around 16 and a half inches high, the statue was originally exhibited at the famous Paris Salon art exhibition in 1897, and subsequently bought by the French government for the Galerie du Luxembourg in Paris. Gérôme’s mastering of ancient Roman and Greek sculpting styles ensured his works are some of the most revered examples of the 19th century neo-classical revival. He died in 1904.